This review is an attempt to assess Final Cut Pro X, what may now be the most written about nonlinear editing tool in the history of nonlinear editing tools. To some, this review may feel unfinished. In that respect it is very much like Final Cut Pro X itself. Writing a review of a piece of software that is clearly designed to do so much could go on forever. But I can't touch on everything here. Forgive me if I skip over certain features entirely (like FCPX’s color correct, actually a very nice feature with auto-correction, primaries and secondaries). After using FCPX for a few weeks I still believe what many initially thought upon first seeing FCPX back in April: This is just the first version of a new application and in this form is essentially iMovie on steroids. There are just too many things that Final Cut Pro 7 users will be missing when they really dig into FCPX. It's not that we won't be able to make cool effects and pretty video, it's just that we'll do it in a much different way without some tools that we now take for granted. Word from people who are smarter than I am say that FCPX isn't built off of current iMovie code. I still find that hard to believe, as the similarities are striking. If they aren't based on the same code then Apple made a very conscious, very clear and very targeted decision to copy an awful lot of what's in iMovie now. Some of it is actually for the better but a lot of it is for the worse. 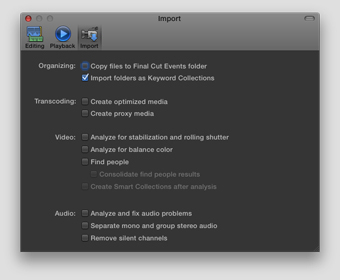 • Organizing: FCPX manages things much differently than FCP7 ever did. It's obvious from booting up FCPX that Events, basically our new master folders/bins for storing media, are now the way to think when it comes to organizing your clips. Keywording clips and parts of clips takes the place of labeling, markers and subclipping. Collections and Smart Collections are the only way to organize. Gone are the days when we could just willy-nilly drag and drop everything we ever wanted from the Mac Finder into different FCP bins (more on that later). •Auto Save: FCPX does have automatic saving. If there is a crash (which I'm hoping will one day be a thing of the past), we should open back up right to where we left off. I’ve had only a few crashes while using FCPX, and for the most part, it saved properly. But once when I re-opened the application a new event, which I'd just created, was missing. •Unlimited Undo: It’s exciting to see an unlimited number of undos since the last time a project was open. Thank FCPX’s new database-like project format for that. The undo/redo menu also tells you what those actions actually are. What's missing, however, is a full undo/redo list so we could quickly move right to a specific operation. Come on Apple: if you’re going to use a database then really use it! Both Avid Media Composer and Adobe Premiere Pro offer this. •No More Single File: Project files are no longer a single file that might balloon in size but rather a series of folders that might balloon in size. They must always reside in some very specific places for FCPX to be able to see them. 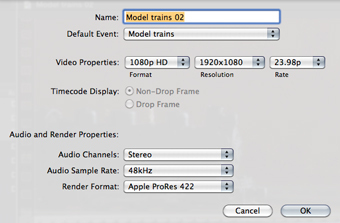 This is yet another big change from the way FCP7 works. •No More Dual-Monitors: Also gone is the more traditional FCP7-like Viewer/Canvas two-monitor layout. The viewing window changes to the timeline or the clip events depending on what you’re doing. In my time with the new software, I have come to really, really miss that two window layout. One very important, very new and very cool part of FCPX is its ability to instantly analyze media upon import into the application. It analyzes for problems like unstable cameras, rolling shutter, color and audio issues. It will also analyze for content by finding people and guessing at shot framing. There's a big batch of preferences for doing this analysis while you import footage, parts of which can be turned on and off. Similar options are prevalent throughout the application and we see them in several places beside just the rather simple FCPX preferences. 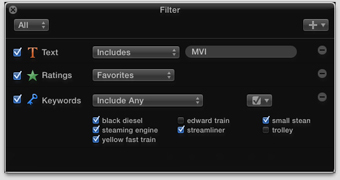 It's important to thoroughly understand FCPX's import preferences before you start. FCPX does work natively with a lot, though not all, of available camera formats. There is an option to transcode media upon import and you have the choice to transcode to ProRes as optimized media and ProRes Proxy as proxy media. There is no option for choosing a flavor of ProRes, for example transcoding to ProRes LT vs. ProRes HQ. I miss the option for ProRes LT; I’ve grown to love that little flavor of ProRes. FCPX does a great job working with native media but the best performance comes from transcoding to ProRes. Thankfully, you can manage this at import or save the process until later. What I think might be FCPX’s strongest feature is the way it performs Background Tasks. Everything from transcoding and rendering to clip analysis is handled seamlessly. These can all be monitored and managed from the Background Tasks Manager, where they really stay out of the way. You can pause them when needed and resume them when the time is right. IMHO, this is where FCPX shines as an app for the future. I just don’t think the same can be said for the actual editing interface. 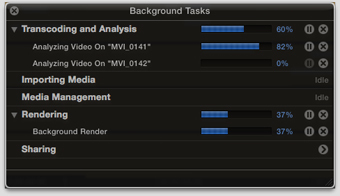 The FCPX Background Tasks manager is one of FCPX’s best features. There is the option of importing from tape, but that's only from a tape-based camera and only via FireWire. Why Apple included only FireWire camera support is perplexing. It seems downright silly to rewrite FireWire tape support for FCPX and not include something like multi-clipping, especially when it feels like you approach something close to multi-clips when you use the new Synchronize Clips feature and have it sync multiple camera angles. Sure, the resources for FireWire support might be vastly different than support for third-party I/O hardware (which isn’t supported out of the box) but FireWire support for DV and HDV? Really? When Apple, and an entire industry, is moving away from FireWire? When importing from file-based cameras, the interface is very straightforward: you see a thumbnail for each file on your media card and choose which to import. You can select the range of a specific clip with yellow iMovie-like range selection handles. This FCPX import window feels like a big step backwards from FCP7's Log and Transfer tool. We have only a fraction of the options here that we had there. I do like the fact that you can get to work as the clips import. This is yet another example of how well FCPX manages background tasks. Another very nice new feature is the option to create an archive of media that can then be self-contained for backup, moved and then imported back into FCPX. We all know we need to focus more on archiving, and this puts it in people’s minds at the outset. If only there was a way to archive a finished edit, deleting unused media with handles. I never thought I'd say I miss the FCP7 Media Manager but I miss the FCP7 Media Manager. 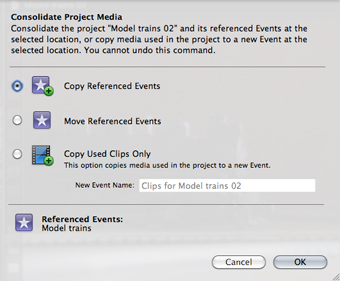 When media comes into FCPX it must be associated with an Event or dropped into a new Event created upon import. Forget about project-based media; everything here is based on Events. In fact, all the media you’ve ever imported is available all the time. This feature alone can be totally amazing and/or insanely frustrating; I experienced both feelings when using FCPX. There are definitely times I don't want media from other projects available, especially in a professional environment, where you can have hundreds of hours of media from different clients on your media drive. Conceptually, it’s an interesting idea for the right environment but in practice FCPX desperately needs some type of "Event Media Mounting Manager" to keep unrelated media from intruding on an unrelated project. You can physically move the media in the Mac Finder to hide it from FCPX but isn’t this an application for the future? That seems really antiquated. Once media is imported and you have Events in the FCPX Event Library, you can organize media by Collections and Smart Collections. Bins as we know them in FCP7 are gone. Folders can be added but those are for organizing collections, not Events (hey, there’s an idea for hiding media right there). Collections are based on criteria of the editor’s choosing, such as keywords. Smart Collections are based on automatically generated data like keywords, text, date ranges or shaky footage. The bigger and more organized the project, the more collections are needed. We'll have lots of twirly disclosure triangles to twirl up and down as we work in FCPX. I’ve felt less organized overall, since you can’t have multiple Collections open at once in their own dedicated window. There are specific options for importing an iMovie project and an iMovie library. What there isn’t an option for is importing a legacy Final Cut Pro project or FCP XML. This glaring oversight has been well documented and is a deal breaker for many shops when considering a move to FCPX. FCPX projects seem to look and behave very much like iMovie projects (another reason this iMovie comparison is so hard to shake). Projects can live on internal or external drives, as can media, of course. A "Project" here is basically a timeline. You can have more than one project/timeline open at a time but it’s not as apparent as it is in FCP7, since there’s no tabbed timeline interface in the new version. Before you start working in FCPX, spend some time investigating its very different timeline navigation to understand exactly how it works. What makes it challenging, at first, is that you can open different types of FCPX clips (Compound Clips, Synchronized Clips) into the timeline, compounding timeline navigation even further. It’s not terribly confusing once you understand it, just different. But it does make me miss the simplicity of tabs. You can also save different versions of a project/timeline/edit. That’s done at the main project window and organized into folders. FCPX appears to load all projects when it opens. I wonder if FCPX might bog down when multiple revisions of a large edit are saved. I didn't test it here, but over time, I might have 20 versions of a timeline on a particularly complex edit. You also have to associate the Project with a specific media format, as in resolution and frame rate. This can be set to automatically base your format and resolution on the first clip you import or as a custom setting. A simple project settings window is used for adjusting project properties. This is also where you can change audio parameters from the default surround mixing to stereo. These should be the other way around. Project settings options appear in this simple window. This type of project setup, and the more structured way FCPX stores and tracks media, reminds me very much of Avid Media Composer. Media Composer has always been great at both media management and mixing formats. Avid's often been chastised by FCP users for it's structured, less free-flowing way of working, but Apple is doing something very similar now in FCPX. As I mentioned earlier, after importing your media resides in the Event Library. Click on an event or a collection and you can view your media in what is in essence a single, big bin. You can use both a film strip and list view. IN and OUT points can be marked via keyboard shortcuts or by dragging. The FCPX list view, where you can see column bin metadata for viewing and sorting, will look the most familiar to FCP7 users. Unfortunately, there are not near as many data columns as there are in FCP7 and you can’t save a custom bin column layout. I was surprised to see the reel column, since we're supposed to be moving away from tape. But if you work with transcoded media like RED, reel metadata becomes very important for a number of workflows. If you’re used to working with multiple bins open, you'll have a big adjustment to make when working in FCPX. As I mentioned with the little twirly triangles, I feel like I’m searching around FCPX Collections a lot more when working on a complex FCPX project. That’s not because it’s less organized than FCP7 but because there aren't as many options with which to view media. It’s one Collection at a time, either in list or thumbnail view. The list view option contains column bin metadata for viewing and sorting. Building an edit is very much like you would expect, especially if you've used iMovie. Sure, 3-point editing is kind of there but it's not necessarily the 3-point editing we've grown to know and love. Backtiming now requires editing with a modifier key instead of basing it on an OUT point. Everywhere you move in FCPX, both in the timeline and the filmstrips, there’s the option of "skimming." Skimming is sort of like the live scrubbing idea I once proposed in some as-then-unamed software from the future. Skimming the timeline gives you both a traditional playhead and skimming marker (not sure what to call this skimmer playhead) that can be placed separately. Depending on how you perform an edit, either the playhead or skimmer can be used as your IN point in the timeline. It’s definitely a new and potentially faster way to work. There are several different ways to actually edit clips into the timeline, including drag-and-drop with the mouse and by using a number of different editing commands. The new insert edit buttons in the toolbar might seem convoluted at first but it's more the fact that FCPX uses some new editing ideas, all of which are conveyed when you open the tooltips pop-up in the toolbar. I think it's a safe bet that most all of us legacy FCP users will be learning something new when it comes to editing clips into the timeline, be it the first time we open the software or as we work on an edit. The timeline has done away with video and audio tracks as we know them and therefore, it’s a very free form way of working. 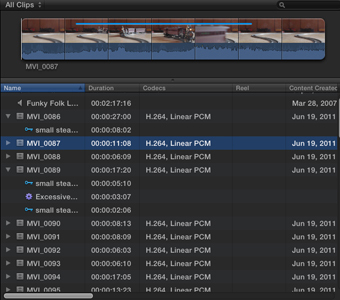 The magnetic timeline means clips move out of the way where clip collisions might have happened in FCP7. This new, freer way of editing will suit some; others it will not. I like quite a lot of what Apple is trying to do to make editing faster and better, but there are other things in FCPX that really don’t make the overall editing experience any faster or better. You really have to try it yourself, which makes it rather frustrating that there isn’t a free demo available. Most, though not all, of the FCPX keyboard shortcuts seem the same as FCP7. There is a full keyboard mapping interface. I’ve heard some people call the FCPX keyboard mapping tool revolutionary, but it’s basically the same as what was in Motion 4. Since hardly anyone used that version not many have seen it before. JKL scrubbing is there. There are keyboard shortcuts to move between the timeline and events. Entering a timecode value for navigation in the timeline works but you have to hit the keystroke of control+P to enter a value. You can’t set a master sequence timecode. Thankfully skimming can be turned off in the timeline. While it’s helpful there are times when it’s annoying. With the skimmer active you can use the skimmer as an IN point in the timeline. There are no timeline IN and OUT points as we know in FCP7 so when the skimmer is separated from the playhead the skimmer takes precedence as an IN point. Overwriting, for some reason, seems to be discouraged. There is no overwrite button in the tool bar (it is in a menu, as well as in a keyboard shortcut). It seems Apple prefers to use new Clip Connections to place clips above what is essentially track Video 1 — the Primary Storyline. FCPX's new editing paradigm based on storylines and connected clips make this idea of overwriting a bit more complex. This is one of those new things that legacy users will have to experiment with to begin working with it in a natural way. I don't mind editing this way but then the old way worked well, too. Within FCPX's bold new timeline you can change appearances, to an extent. There are options for the clip's size and for thumbnail display. You can enable and disable clips as you can in FCP7. Subframe editing is right in the timeline. While there are presets for several timeline displays there is no way to save a custom layout. Yes, FCPX does away with the "tracks" idea but clips are still laid out horizontally in a similar fashion to what we have now. My fear is this free-form timeline will lead to some real sloppy jobs coming in the door if FCPX catches on. You also can't just have a gap in the timeline anymore. Any gap will have to be placed there on purpose and it'll essentially be a SLUG. In fact, to drag a clip and make a gap you have to choose a specific Position tool. That "gap clip" can then be edited and trimmed like any other clip. Remind anyone else, as it did me, of Filler from Avid Media Composer? Trim tools are their own tool category on the toolbar; you access different types from a drop-down menu Trimming is very click-and-drag specific. Slip and Slide editing is also possible when working with the trim tools. Trimming will be identified by little cursor icons in the timeline as you move over and around edits. Again, remind anyone of the Avid Media Composer Smart Tool? There is a two-up display that can be toggled on in the Viewer so you can see what you're trimming. I'm not sure how you'd trim without it. The Precision Editor looks an awful lot like iMovie, too. Visually it's quite simple when it opens in the timeline and it'll be very easy to learn. But it is very imprecise to use. What it doesn’t have is any kind of Dynamic Trimming where you can actually trim by JKL scrubbing or on the fly playback. I was assured by an Apple employee at NAB that some type of Dynamic Trimming existed. I'm not sure he knew what I was talking about. The Audition feature, however, opens up a very exciting new way of working. Drag a clip onto another clip and you can make an Audition. You can then toggle through all the clips in an Audition several different ways. For quickly reviewing different versions of a shot or auditioning different music cuts there’s really nothing faster or easier. Audition "spotlights" your clips and organizes them for easy previewing. Like FCP7, FCPX has a Share menu. If you have the right hardware, DVDs can be burned from FCPX, including Blu-ray. There is no more DVD Studio Pro application. Internet publishing options include YouTube, Vimeo, Facebook and the citizen journalist-targeted CNN iReport (but no Mobile Me). I was happy to see that you can export a self-contained QuickTime. But overall export settings directly from FCPX are limited. There doesn’t seem to be a way to export a QuickTime reference file directly from FCPX. Another strange thing is that the only way to export a range in an FCPX timeline (i.e., from an IN to OUT point) is via Compressor. 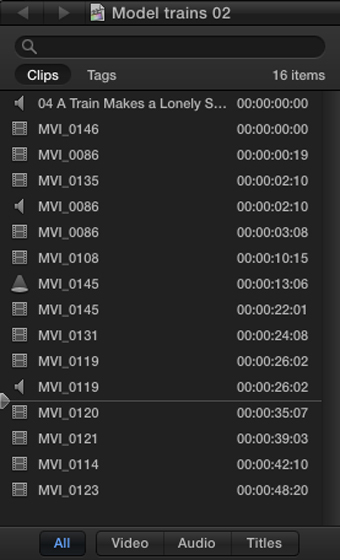 Exporting directly out of FCPX exports the entire timeline. That doesn't seem terribly accurate. There is a nice option to Export Using Compressor Settings from within FCPX. You can then choose to apply your Compressor presets or those you've created. Compressor is still an important part of exporting from FCPX, so you might as well count on spending the additional $50 when buying the NLE. While the Compressor interface looks nearly identical to what we have now, there are a few subtle tweaks. There's now an Apple Qmaster menu item that should make distributed rendering easier. Batch Monitor is now called the Share Monitor. Unfortunately, you now have to do things like adding Chapter markers in the Compressor Preview window and not in FCPX. In fact, Markers took a huge step backwards in FCPX: They can only be added to clips and not the timeline itself. There is also only a single default color and you can’t extend Markers to custom durations. But you can check off new To Do markers in the new timeline index as those tasks are completed. The new timeline index is a nice way to keep tabs on everything. Effects are applied by dragging them from the Effects browser. There are actually a lot of browsers, including those for effects and titles and those for your iTunes and iPhoto libraries. I’m not sure it was terribly important to have built-in iTunes/iPhoto access in a pro app but they are there. The new effects architecture lets you get a skimming preview of the effect on a selected clip. Nice touch. Roundtripping to the new $49 Motion 5 isn’t possible any more, as Motion now seems to be more about building effects and graphic templates and then publishing those for use in FCPX. 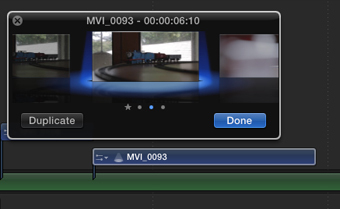 It seems like an odd omission to not be able to send a clip (or range of clips) from FCPX to Motion and back. Apple says this is a way to move Motion templates and controls into Final Cut without requiring that an editor learn Motion or even have Motion installed or open on their computers. Keyframing effects and clip motion parameters is clean and simple as a video animation timeline can be opened right in the main editing timeline. Certain parameters can be expanded to see keyframes on a traditional animation curve, which is very convenient. What’s inconvenient is that you can’t custom arrange the FCPX windows depending on the task at hand. But I couldn't find a way to save an effect after I'd tweaked the parameters, which is strange. 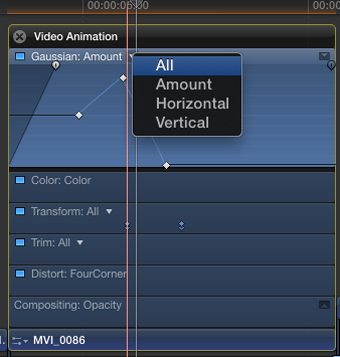 Animating effects can take place right in the FCPX timeline. Audio editing feels very clunky at first. You often have to expand or detach audio from its video clips to see it in the timeline. After that, you can go to work adding any number of very powerful audio filters. Audio fade handles are now built into audio clips, which is nice. But creating a normal audio fade between two clips is much more difficult than it should be. When I encounter features like that it makes me think there was not enough beta testing or FCPX was designed by people who don’t really edit. Oh, and there’s no longer an audio mixing tool. The new Media management in FCPX may seem to offer more options to editors, but it actually uses a very rigid, specific way to store clips, renders and projects. If you were a sloppy editor in FCP7, then you’ll be fine in FCPX, at first. But if you don’t really understand how FCPX organizes your media you might be in for some trouble if files get moved and drives get shuffled. As an editor who has worked for nearly a decade on many different software packages (thankfully I missed the linear-tape days) a new interface doesn’t scare me. In fact, I welcome it. But FCPX has changed so much and in such a way that making a judgment call on it is difficult. Most things in FCPX I either love or hate. There’s very little I feel so-so about. I love how FCPX can easily toggle an edit between a full-resolution ProRes edit and a low-resolution ProRes Proxy version. I hate that the option to transcode to ProRes LT is gone. I love how skimming means you’re holding down a mouse button less. I hate how there’s no real dedicated Viewer window when I skim those source clips. I love the overall metadata capabilities and how they can work to an editor’s advantage. I hate how imprecise much of the actual editing process has become in the magnetic timeline. How much real-world editor feedback did Apple really get before this came to market? Even though some very high profile editors got a chance to evaluate it before the release, I'm more inclined to think it was designed by a bunch of engineers who don’t actually edit for a living. Either way, it just feels unfinished. I won’t be implementing it with my paying clients as of this version, and probably not for a few versions to come. But I’ll happily bang out home movies with it. Next articleThe Best Video on the FCPX Debacle.